The BMW X3 offers 8 inches of ground clearance. The available M Sport suspension means you'll always have the most comfortable ride possible, whether you're on the highway or off-road. There's up to 62.7 cubic feet of storage space in the X3 when the rear seats are folded down. Finally, intelligent all-wheel drive means the X3 knows when to apply more torque. The X3 is also totally connected with iDrive for navigation. 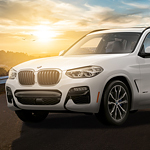 Experience the uniquely sporty, luxurious BMW X3 today. Come see us at BMW Seattle. We'd love to set you up with a test drive.